L.J. Reynolds, frontman of dynamic R&B vocal group The Dramatics, releases the new single, “You and Me Together, Forever.” Written and produced by Reynolds, with string arrangements by Paul Riser, the single is climbing the Urban Adult Contemporary Radio chart. 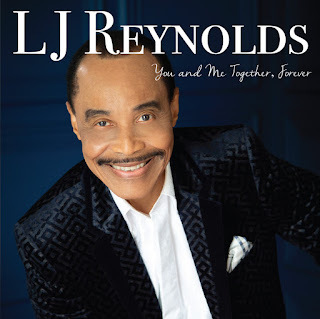 “You and Me Together, Forever” is released on Reynolds’ label, Motor City Hits/Crystal Rose Records, and will be featured on the forthcoming album You and Me, scheduled for release in February 2019. “You and Me Together, Forever” is available at digital retail outlets including iTunes, Amazon, and Google Play, among others. Reynolds recently produced and directed the video of “You and Me Together, Forever” with his co-director, Diego Cruz through Reynolds’ company, Magnificent Productions. Reynolds video, “You and Me Together, Forever” is currently on Vevo and YouTube. The single is the first taste of Reynolds’ forthcoming tenth solo project, You and Me. For the album he also recorded and produced a remake of a Marvin Gaye classic, which he has titled “Mercy, Mercy Me/Stop The War, Save The World (I Just Can’t Stop Dancing).” He also recorded a brand-new version of his ‘70s hit classic, “Key To The World,” now retitled “Giving All My Love, Key To The World,” that Reynolds rededicates to his lifelong fans. Reynolds’ previous album, Get To This, featured the hit single “Come Get to This/Stepping Out Tonight,” which peaked at No. 24 on Mediabase’s Urban Adult Contemporary chart. Other chart-toppers include “Cheating on Me” and “You Sure Love to Ball,” each of which was released with a video. Reynolds began to master his craft as the lead singer of the Relations, followed by Chocolate Syrup, before he burst onto the scene in 1972 as the new lead singer of The Dramatics. His cascade of hits and fan favorites includes the Top 10 single “Fell For You” (A Dramatic Experience, 1973), “And I Panicked” (Dramatically Yours, 1974), “Door To Your Heart” (The Dells vs. The Dramatics, 1974), “(I’m Going By) The Stars In Your Eyes,” “Me and Mrs. Jones” (The Dramatic Jackpot, 1975); “Just Shopping (Not Buying Anything),” (Drama V, 1975), “Be My Girl,” “I Can’t Get Over You,” (Joy Ride, 1976), “Do What You Wanna Do,” “Stop Your Weeping” (Do What You Wanna Do, 1978); “That’s My Favorite Song” (Any Time, Any Place, 1979), “It Ain’t Rainin’ (On Nobody’s House But Mine),” and “Be With The One You Love” (10 1/2, 1980), “Ain’t No Woman Like My Baby,” “Toast To The Fool,” as well as countless others. Reynolds opened the door to the hearts of the masses with his first solo hit, “Key To The World,” in 1981. More than 35 years later, transcending time and cultures, “Key To The World” is embraced all over the world. Reynolds’ rendition of “Call Me” (Travelin’, 1982), previously recorded by Aretha Franklin, highlighted his ability to make a classic his own, while “Touchdown” (Lovin’ Man, 1984) climbed the charts and marked his growth as a multiple instrumentist as well as a singer and songwriter. Throughout the 1990s and 2000s, Reynolds, along with The Dramatics, collaborated with Snoop Dogg on “Doggy Dogg World” (1993) and “Ballin’ (2002). In 2008, Reynolds released his second Gospel album, The Message, collaborating creative forces with Grammy Award-winning producer Michael J. Powell. In 2011, Reynolds busted out with a new twist to his sizzling sound, this time reprising and embellishing upon a Marvin Gaye favorite with “Come Get To This/Stepping Out Tonight” (Get To This). Reynolds refined the production with a steppers’ flavor, and the track quickly became a dance favorite. His powerful vocal range was on display as he once again put his soulful signature on a classic. For additional information on L.J. Reynolds and The Dramatics, please contact Motor City Hits at 248.579.6867 or Brian A. Spears at 702.361.1626.